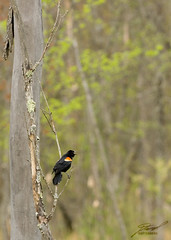 Kensington Red Wing Black Bird; The Call We stopped for a few minutes over the marsh at the far end of the Kensington Metropark to grab a 360° panorama. We were surrounded by Red Wing Black Birds the whole time, but they stayed hidden in the reeds. Finally, this one paused long enough to grab a few frames as he called to the others, then flew off.